For as long as I can remember my holidays have always been associated with travel. Growing up we always took long car trips, first from Florida and then Virginia to visit family in Missouri. We always drove; packed up the mini van and headed towards the center of the country. As a kid, it was kind of boring. Why is this taking so long? Are we there yet? My dad would always say “yes, we’re just in the giant parking lot.” Looking back on it now, I’m glad I had that opportunity to travel and spend time with my family. It created some great memories and also prepared me for traveling as an adult. I’m not sure exactly why we always drove rather than flying, but I remember clearly that we’d always bring all our pets – dogs and cats included – with us. That experience taught me that pets are part of the family too. While its perfectly okay to not always travel with pets, it is nice to be able to enjoy the holidays with them. Now as an adult, I try to include my two dogs in my holiday plans. This year we headed back east from our new home in Colorado for Thanksgiving. We also had another event to attend in Virginia earlier this week, so instead of flying out twice and boarding the dogs while we were gone, we decided to drive out with the dogs (renting a car) and stay for nearly 3 weeks. Obviously driving 25 hours each way is a bit more of a time commitment than flying, but we were able to have our pets with us. Though Ralph & Luna can technically fly, a road trip would be a lot more enjoyable and less stressful for everyone involved. My two dogs – Ralph & Luna – are 100% members of my family. I want to spend time with them and I also want to ensure that they are comfortable. The thought of spending the holidays without them just doesn’t feel complete. Though I know they don’t quite appreciate the holidays as much as I do, I love seeing them light up when they get a special treat or holiday meal. And I have wonderful (hilarious) memories of Luna trying to hoard all the new toys the dogs in our family received for Christmas in her bed. She was so silly and the memory still puts a smile on my face. Long story short, I love my dogs and would be willing to make sacrifices to make them comfortable and bring them along. Traveling by car takes longer than if we were to fly and we have to look for pet friendly hotels (which unfortunately often aren’t quite as nice), but to me it’s all worth it! Even with the cost of gas and pet friendly hotels, for us it can actually turn out to be a bit cheaper to bring our dogs along than if we were to board them or find a quality pet sitter. It also enables us to pack more, so we don’t have to buy items on the other side. I’m also just pretty terrible at packing light in general. To save some money, we look at hotels that allow us to stay with our two dogs for no or just a small fee. Some of our favorite hotel options for this type of stay include Red Roof Inn (affiliate link – Save 10% off with VP Code 604673) and La Quinta. We also try to bring along snacks and even pack lunches, so we don’t have to eat out every single meal. Driving with a passenger also let’s you look out for cheaper places to stop and refuel on gas. Some of my favorite memories since becoming a pet parent are from the trips we have taken with our dogs. I’m lucky to have been able to attend the BlogPaws Conference every year since I started blogging. This conference has also given myself, my boyfriend, and our dogs a reason to drive somewhere new and explore our country. It’s brought us to Nashville, Phoenix, Myrtle Beach, and more. This year we’ll be heading to Kansas City! One of my favorite memories was when we extended our trip to Phoenix and drove all the way to California and back. We saw so many fun road side attractions and got fabulous photos with Ralph & Luna. I cannot wait to do another road trip through a different part of the country sometime soon. Having my dogs with my reminds me to take a few moments and slow things down. It’s really important that I remember that this time of year. Though bringing dogs can add extra responsibilities, I find myself more relaxed having them with me. There is nothing quite like snuggling on a hotel bed or couch with your two favorite pups to cool down after a busy day. It’s true. Initially things didn’t go perfectly, but now they are well traveled and trained. Both Ralph & Luna enjoy staying in hotel rooms and it almost seems like they know a hotel bed is more fun than our bed back home. As soon as we get into our room, they jump right on up as if they know we are on vacation! Not all dogs do well in hotel rooms, so keep that in mind. The last thing you want to do is leave your dog in a room where they get stressed out and annoy neighboring guests by barking their heads off. Know your dog before you travel! My dogs have also gotten more comfortable traveling by car. It’s important for me that they are safe in case of any kind of accident, but also comfortable during the ride. No one wants to be stuck in a car for hours while being uncomfortable! That’s why we regularly use our Sleepypod Clickit Sport Harnesses. They are crash tested, extremely well made, and even fashionable. This year Sleepypod launched a new limited edition color based on requests from customers – True Violet. It’s a beautiful color for both male and female dogs. Currently both Ralph & Luna are both rocking it. In addition to the Clickit Sport, you can get the Sleepypod Mobile Pet Bed, Sleepypod Air, and Sleepypod Atom pet carriers in True Violet. 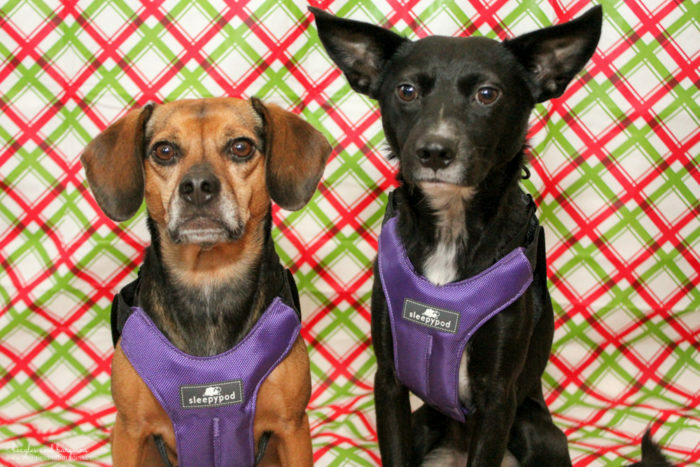 For more on Pet Friendly Holiday Tips, make sure to check out our recent blog post! If you want to learn more about Sleepypod, be sure to follow them on Facebook, Twitter, and Pinterest! 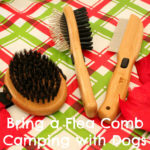 For more tips on Holiday Travel with Pets, check out our post. 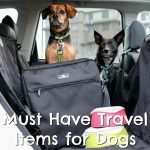 Looking for information on Pet Friendly Road Trips? We have that too! 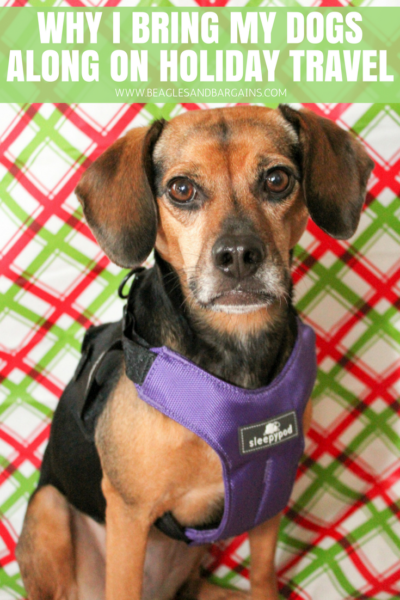 TWO lucky Beagles & Bargains readers will receive a Sleepypod Clickit Sport in NEW Limited Edition True Violet! Residents of the United States and Canada (except Quebec) are eligible to enter via the Rafflecopter below. Entries must be submitted by 11:59 PM EST on Friday, December 22, 2017. Winners will be notified via email within 48 hours of the giveaway closing and will have 48 hours to respond and claim their prize. Two (2) winners will each receive one (1) Sleepypod Clickit Sport in the NEW Limited Edition True Violet color in the size of their choice (pending availability). Approximate retail value is $89.99. 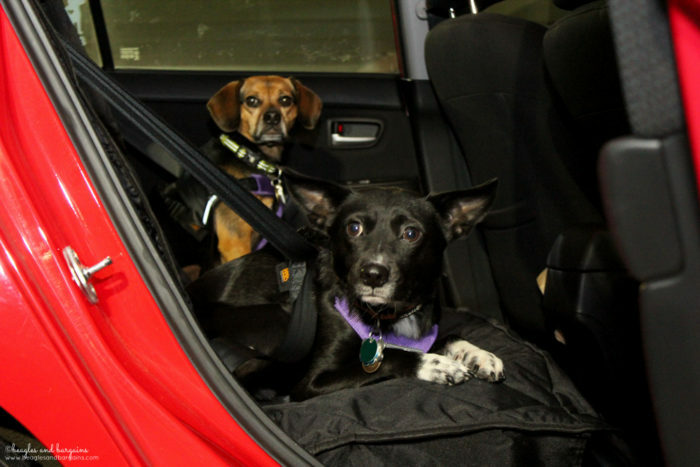 Do you bring your dog along for holiday travel? 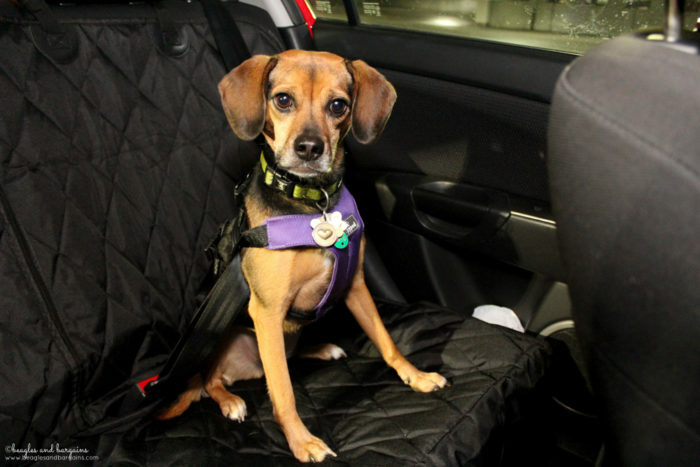 Also, tell us how GOOD your pup would look in the NEW True Violet color? Want to spread the word about this giveaway? 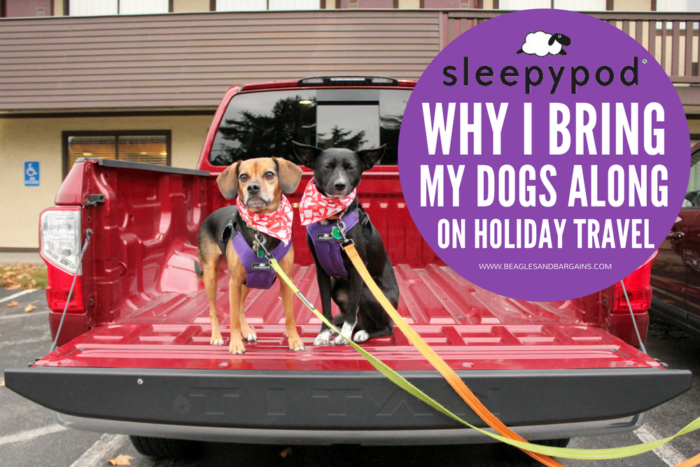 Save Why I Bring My Dogs Along on Holiday Travel by pinning the image below on Pinterest! Disclaimer: Sleepypod provided product free to review. 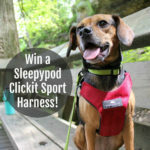 I am being compensated to help spread the word about the Sleepypod Clickit Sport. I received no other compensation or additional benefits for mentioning the brands or products in this post. The opinions and ideas in this post are my own and are uninfluenced by any other person or business. 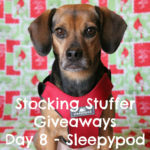 Sleepypod is responsible for all giveaway prizes including shipping. 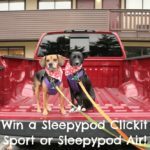 Win a Sleepypod Clickit Sport or Air! PLUS One for Your Favorite Animal Rescue! 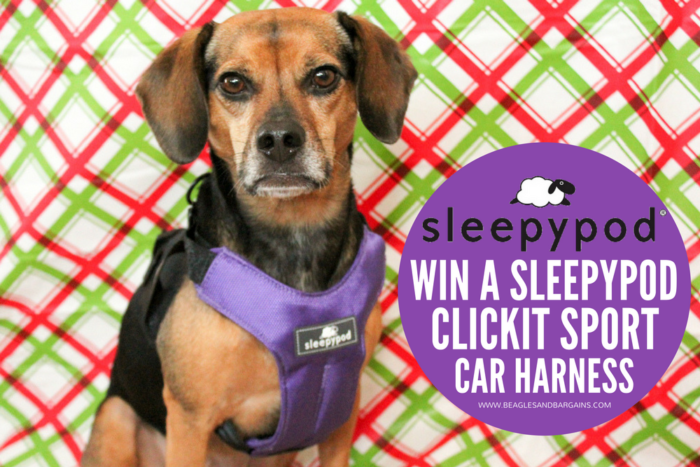 Get Pet Friendly Road Trip Ready with Sleepypod – Win a Clickit Sport Harness!